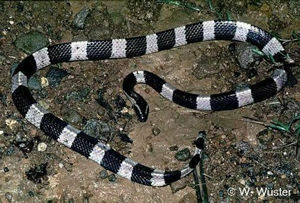 Large in length, moderately slender bodied snake with a triangular shaped cross-section ( pronounced ridge on the vertebral line ) and a short tail. 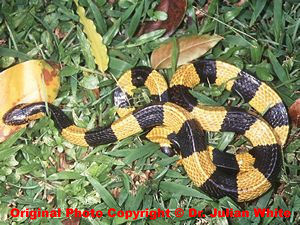 Tail is blunt, thick and slightly bulbous at the tip. Can grow to a maximum of about 2.25 metres. Head is flat and slightly distinct from neck. Eyes are small in size and black with barely visible round pupils. Nostrils are large. Dorsal scales are smooth and glossy with the vertebral row enlarged and hexagonal. Ventrals are rounded. Dorsal scale count 15 ( 17 ) - 15 - 15. Inhabits moist and wet open plains, lowland forest ( particularly mangrove forest ) usually up to about 1300 metres ( 2300 metres has been recorded ) and in and around human habitations. Often found in rice fields and rubber plantations but has a preference for dry open forest and woodlands. 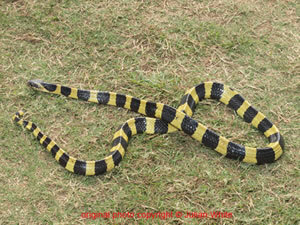 Nocturnal, terrestrial, slow moving and cannibalistic snake. Often found in large numbers. Very inoffensive ( lethargic ) disposition by day. When disturbed it coils loosely and hides its head beneath its body. Reluctant to bite except upon persistent provocation. At night it will strike readily. Feeds on snakes and occasionally eats lizards and other vertebrates. 114 mg ( dry weight ), Brown ( 1973 ) ( Ref : R000681 ). 27.5 mg ( dry weight ), Gopalakrishnakone and Chou (1990) ( Ref : R000004 ). 25 to 50 mg (dry weight ), Minton (1974) ( Ref : R000504 ).